Our Company - Domoslai Designs Ltd.
Our offices are conducive to teamwork and include access to printers, plotters and other necessary equipment. In business since 2001, Domoslai Designs Ltd. is a growing company that prides itself on meeting and exceeding the expectations of its clients. We have the capability to handle small (including miscellaneous) work up to large projects in the public, commercial and industrial sectors. 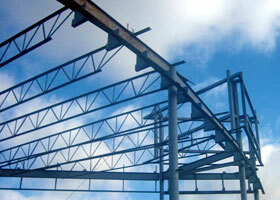 Domoslai Designs Ltd. uses Tekla Structures (X-steel) software, and has nine in-house licences. We are meticulous in our drawing accuracy, and diligent with the presentation of assembly drawings. X-steel also gives us the ability to provide material lists, Fabtrol reports and CNC outputs to increase your productivity. Our dedicated, enthusiastic team is sensitive to construction schedules and timelines, and have the flexibility to meet challenging deadlines. Drawings can be couriered, e-mailed, or accessed via an FTP account.